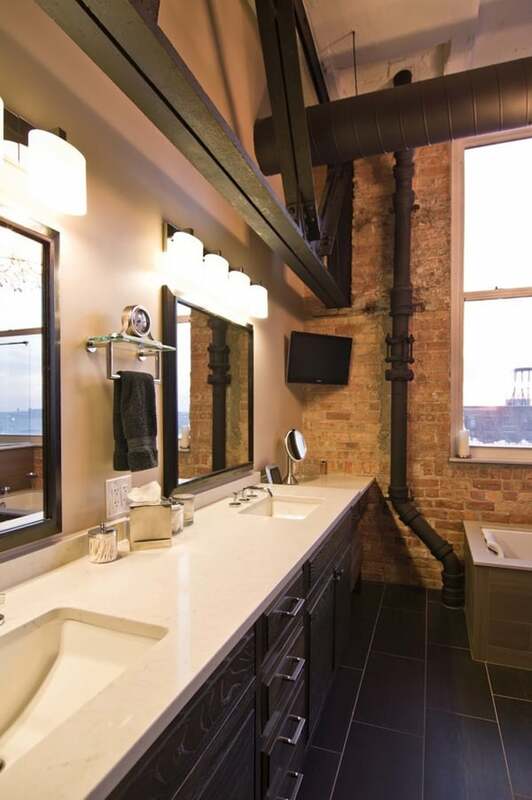 This loft condo renovation designed by Besch Design is situated in a building that once housed National Biscuit Company, now known as “Nabisco” and is located in the West Loop neighborhood of Chicago. 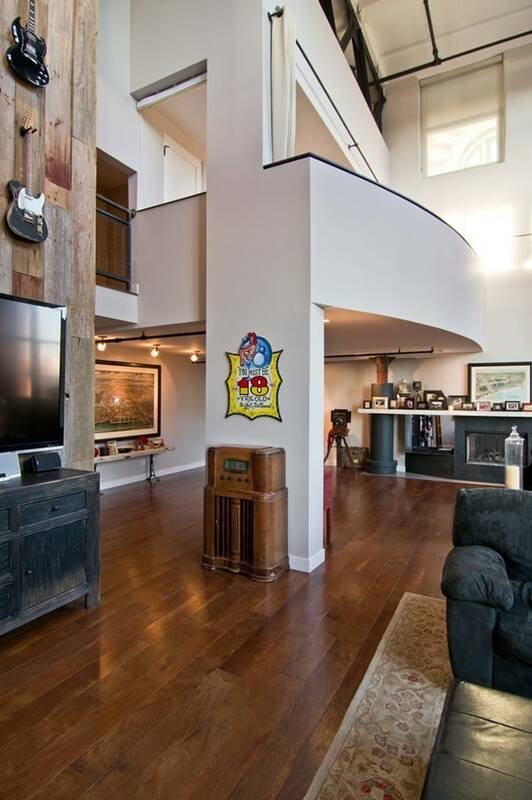 The loft style condo unit is located on the upper floor and is a multi-level unit. 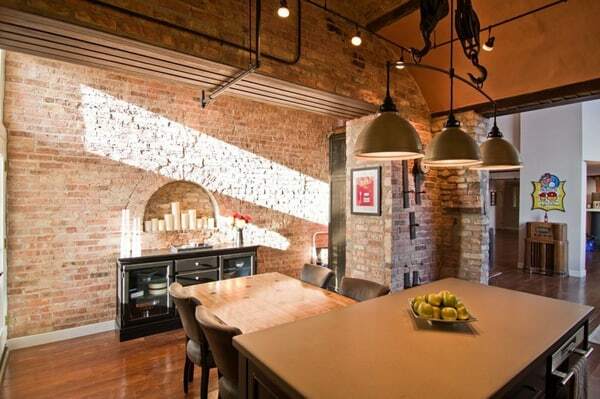 One of the main features is the kitchen, which is located in one of the old ovens used for baking. 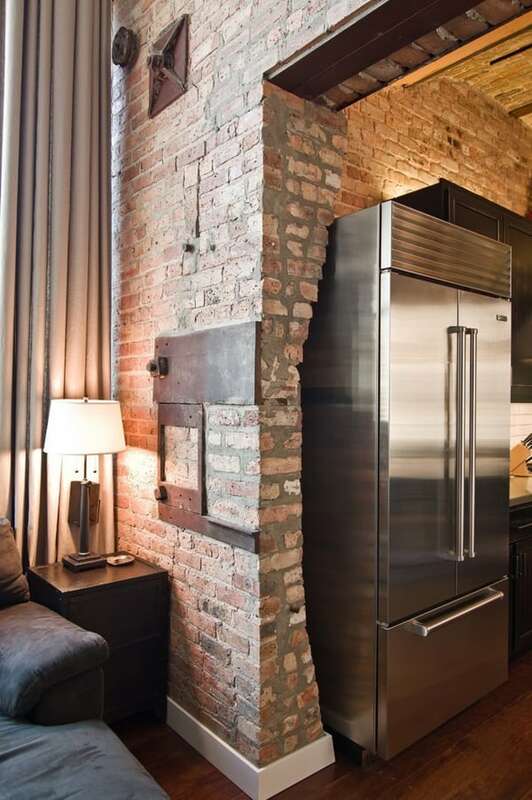 The steel parts for the oven doors are still embedded into the exposed brick. 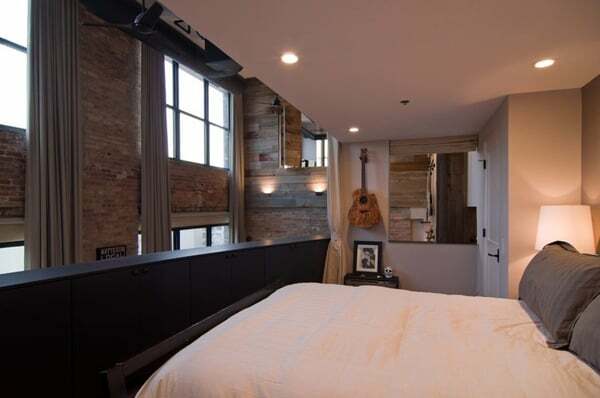 The master bedroom has an opening that overlooks into the living spaces on the first floor. 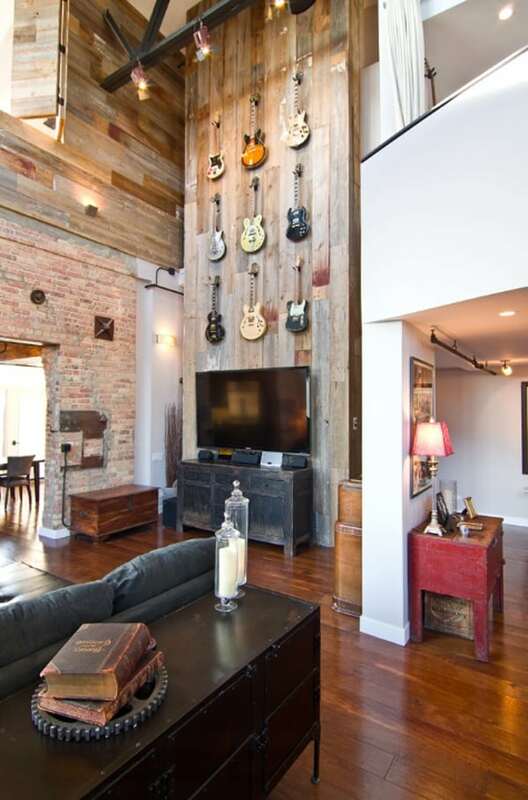 Reclaimed barn wood was used on an accent wall that is has become a feature in the unit and is used to display some of the Owners guitars from his collection. 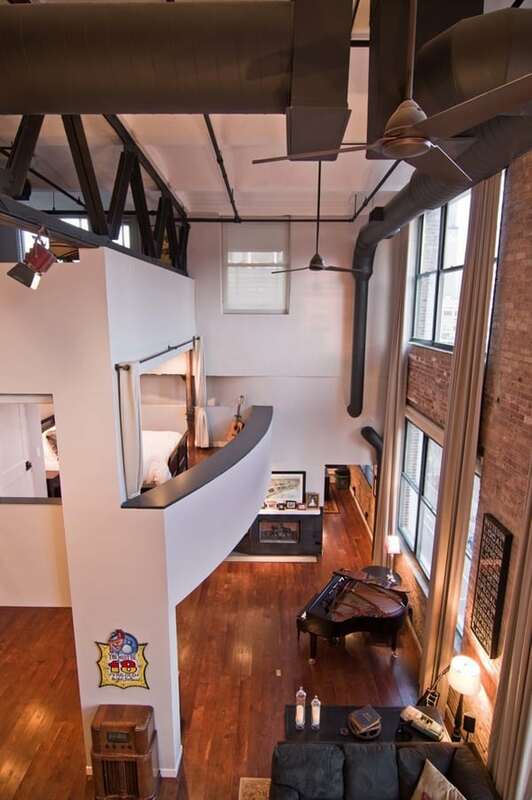 This living space in the multi-story loft unit is flooded with light from two levels of windows. 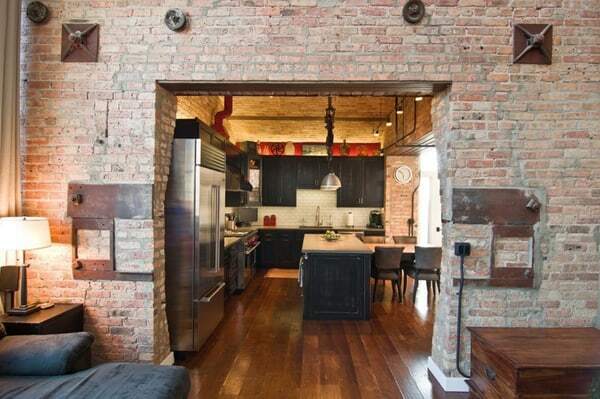 The exposed brick is the old exterior of the National Biscuit Companies (now Nabisco) oven used to bake the biscuits. 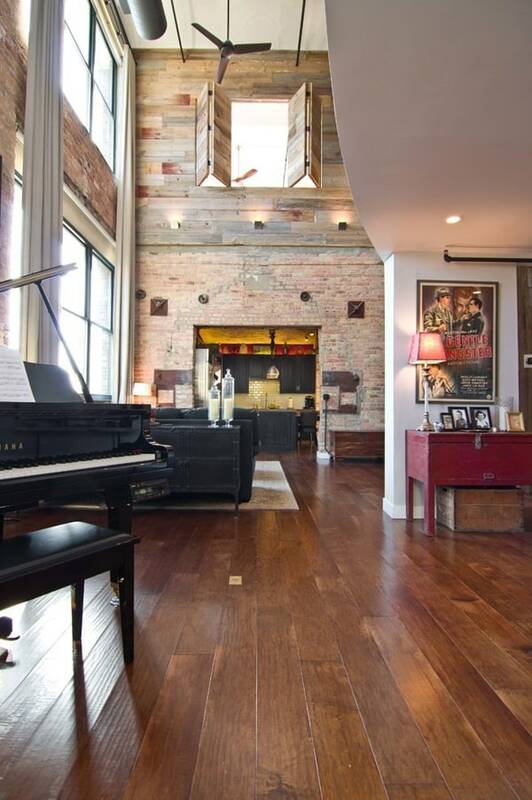 The main family room area of this loft condo features a two story wall that was clad with reclaimed barn wood. 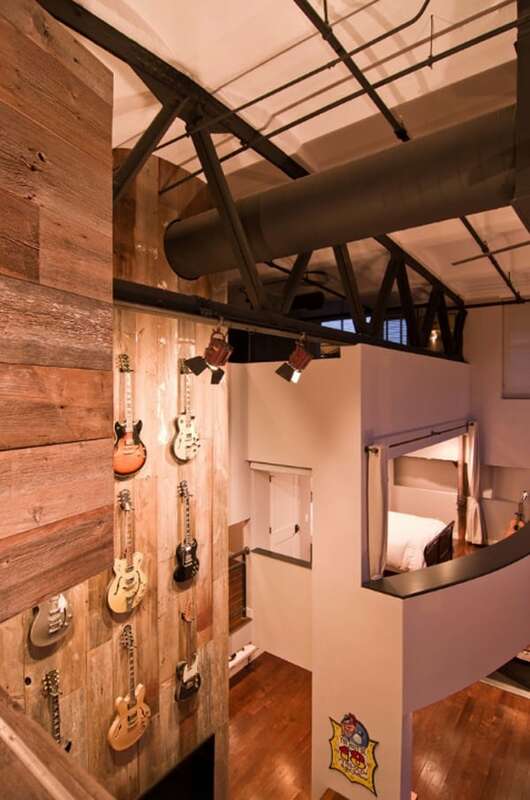 The master bedroom over looks onto this space from the bi-fold door opening above. 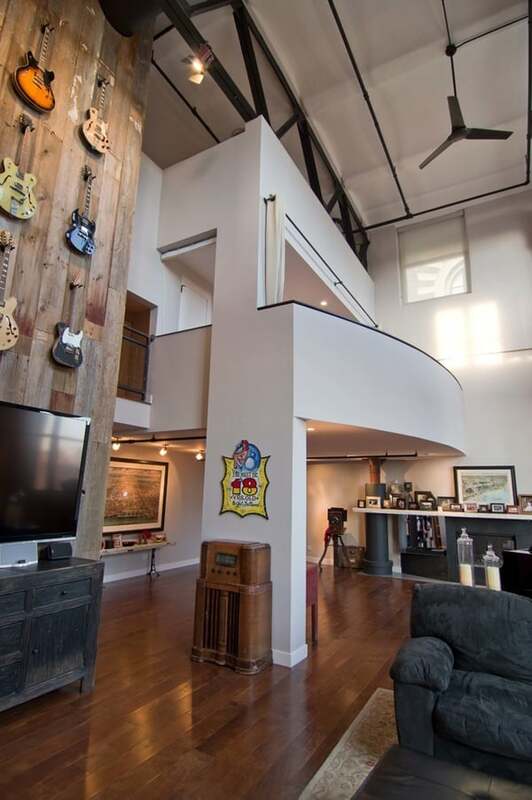 This office loft was renovated to accommodate the owners eclectic collection of movie and TV memorabilia. 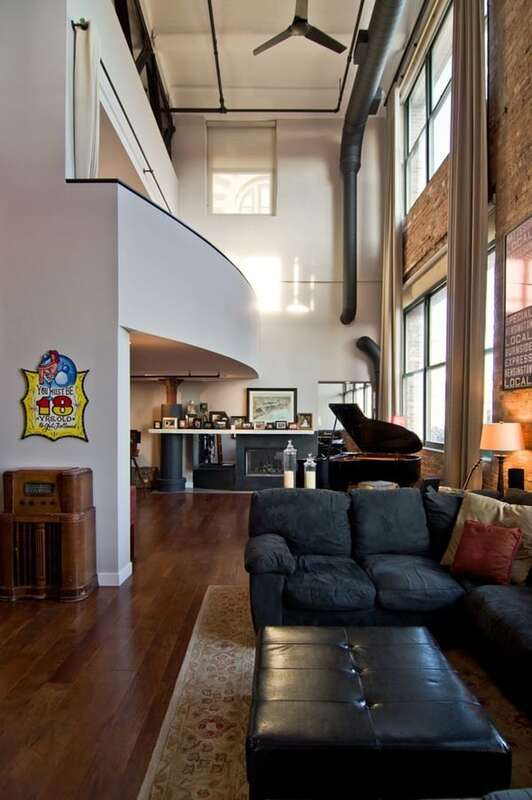 The massive exposed brick wall still has the steel plates and parts that once were the sliding doors to the massive oven that once baked the biscuits for the National Biscuit Company (Nabisco). 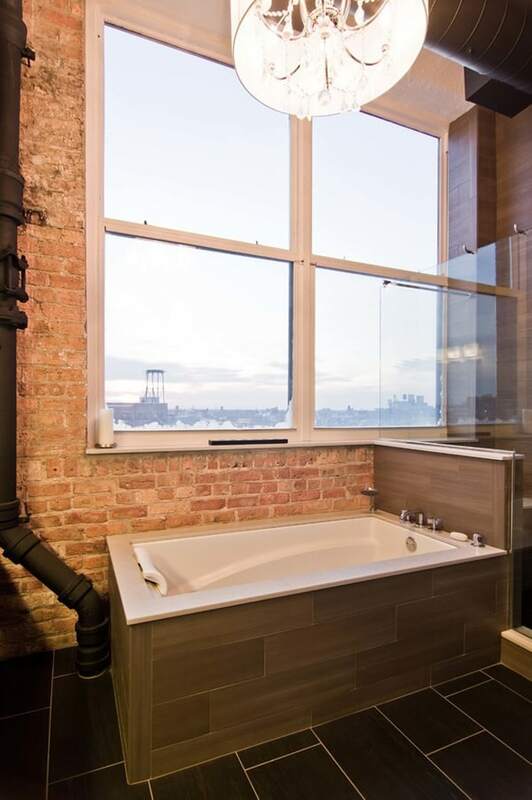 The old oven now houses the kitchen for the unit. 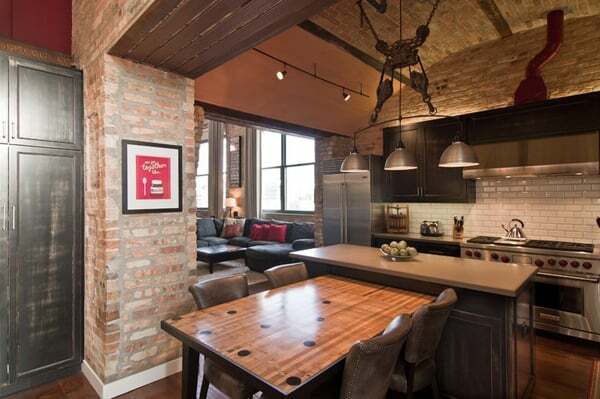 Arched brick ceiling with a custom made light fixture. 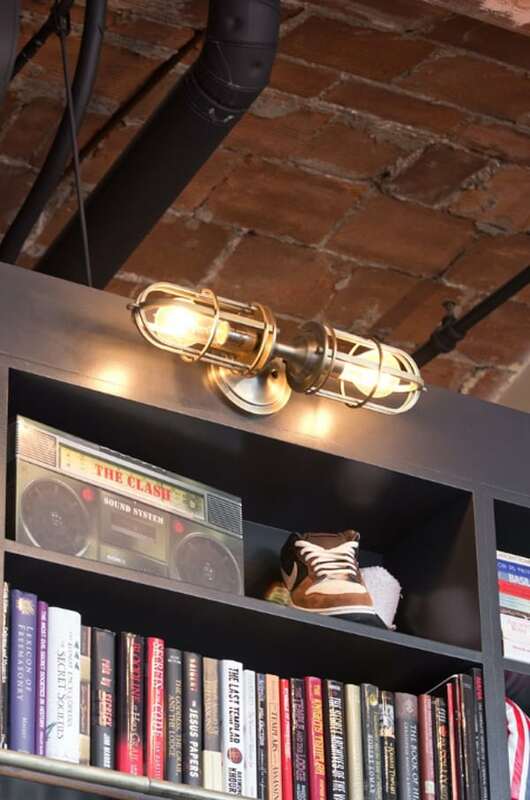 The owners found the parts for this light fixture over the island and had a local artist create this one of a kind fixture. 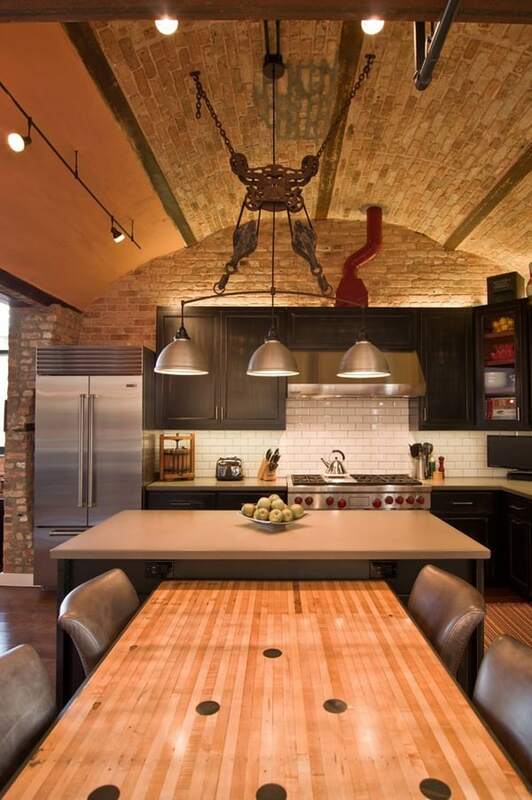 The table with the seating is made from an old bowling alley lane. 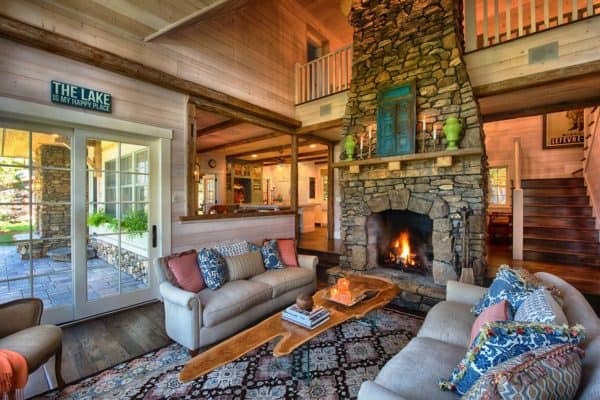 The pin placement marks can still be seen on the table top. 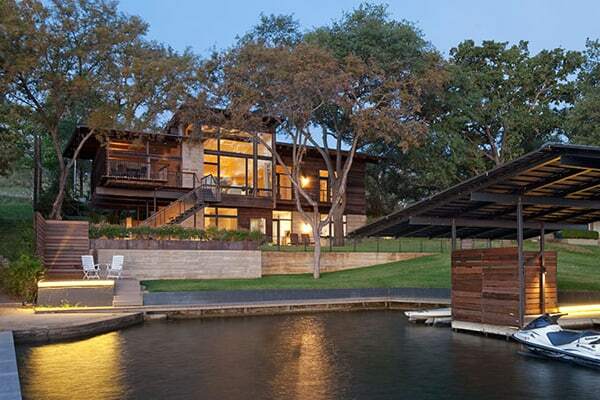 The table is free standing so it can be moved off the island if desired. 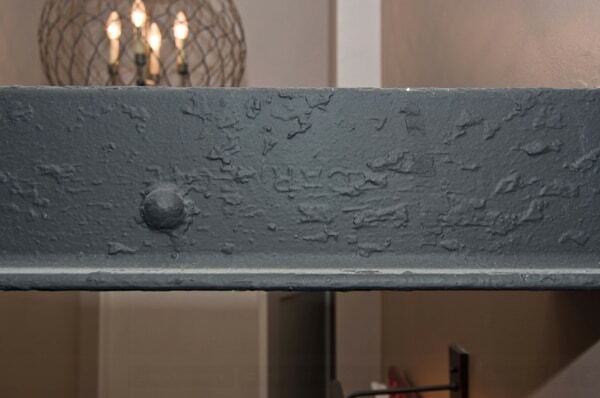 A reclaimed scupper box is the transition piece from the range hood to the duct work with red accent paint. 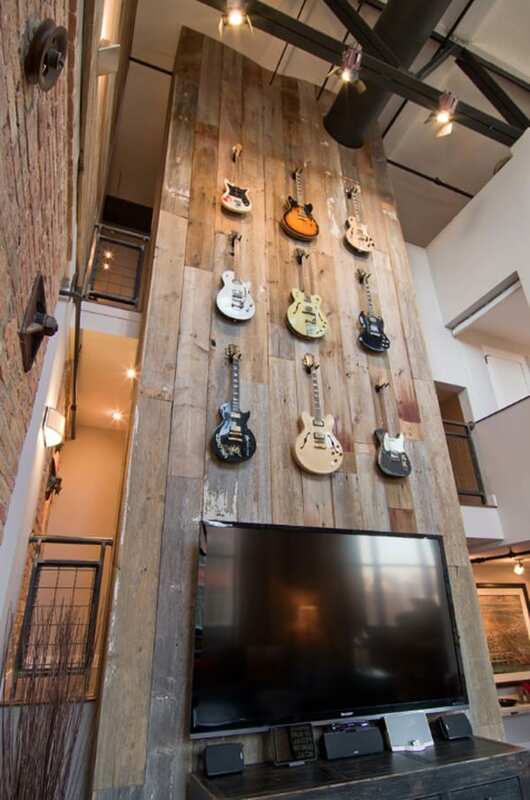 This accent wall is clad in reclaimed barn wood and is used to display the owners guitar collection. 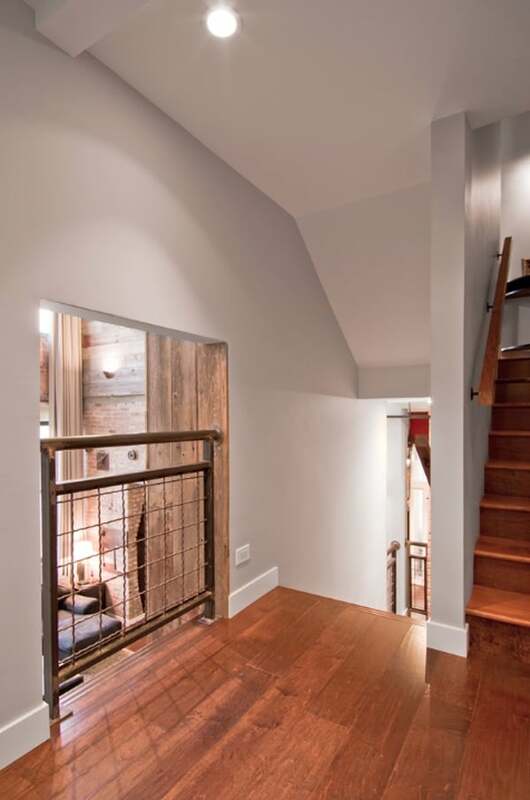 This small opening creates a view to the family room below as one proceeds up to the upper levels on the stairs. 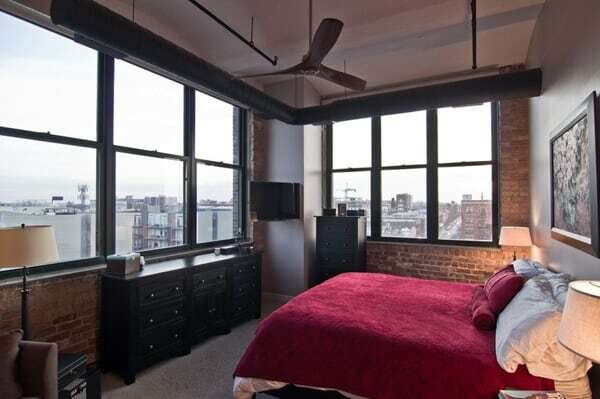 The second bedroom looks out over the family room two story space, with views out the large double hung windows. 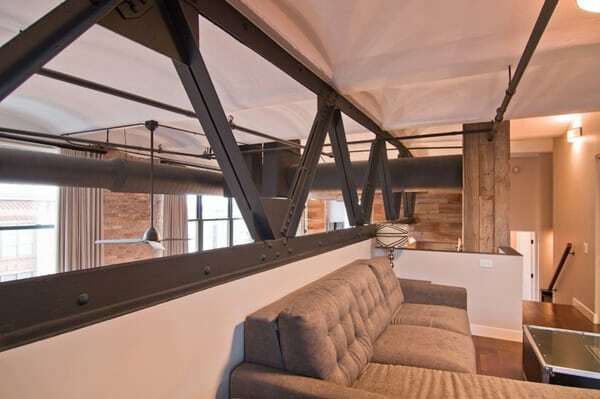 The exposed steel truss cuts through the entire unit. 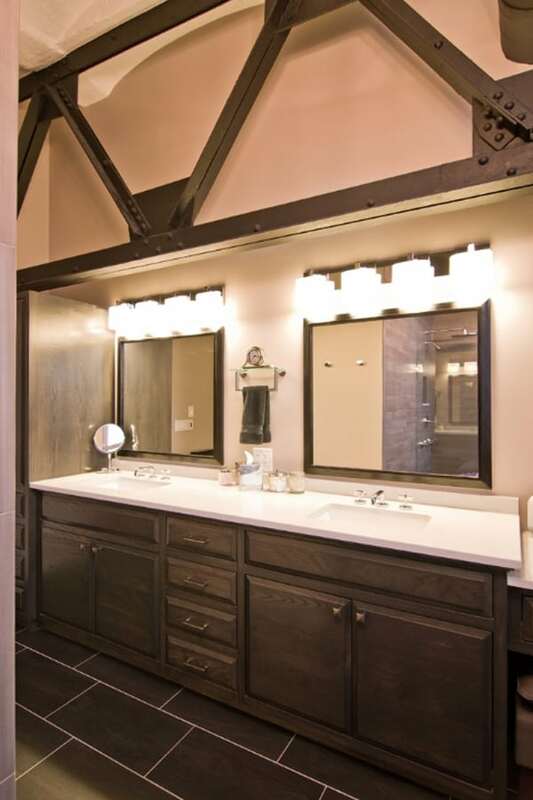 The ceiling was lightened by painting it white which allowed for the truss to be more of a focal element along with the exposed duct work and sprinkler pipes. 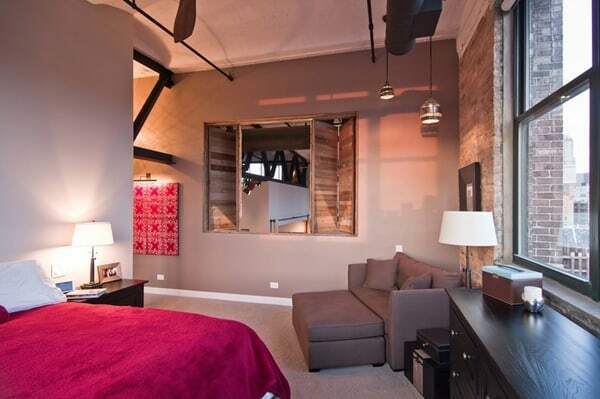 The bi-fold door opens up in the master bedroom to overlook the living spaces below. 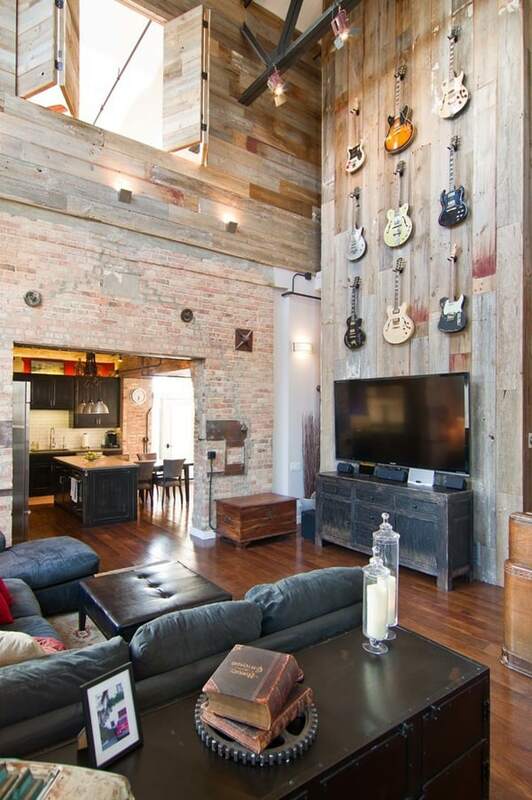 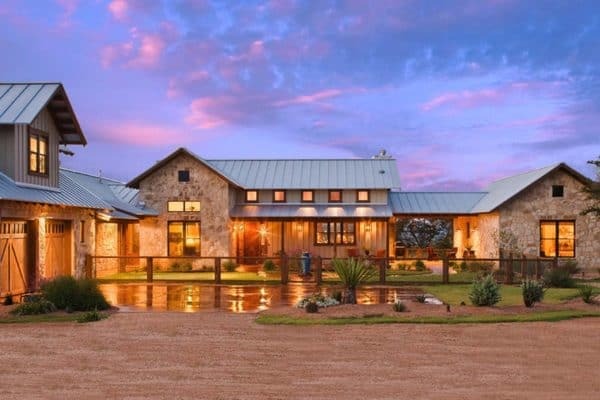 It is clad with the reclaimed barn wood. 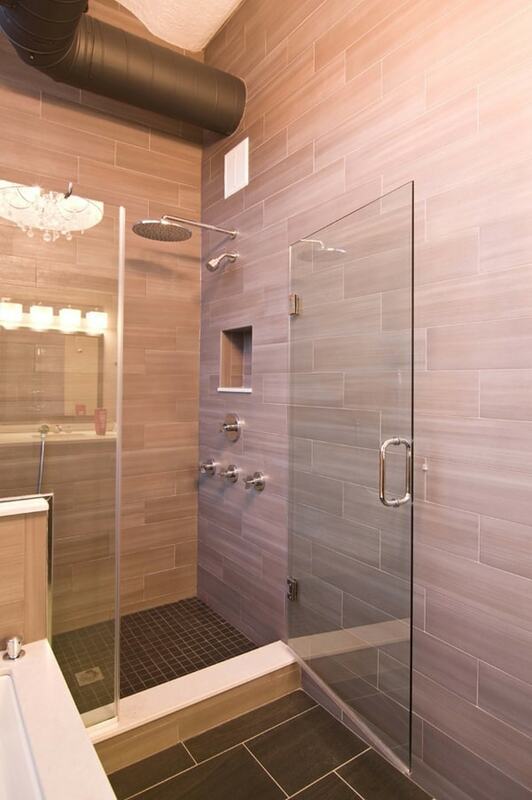 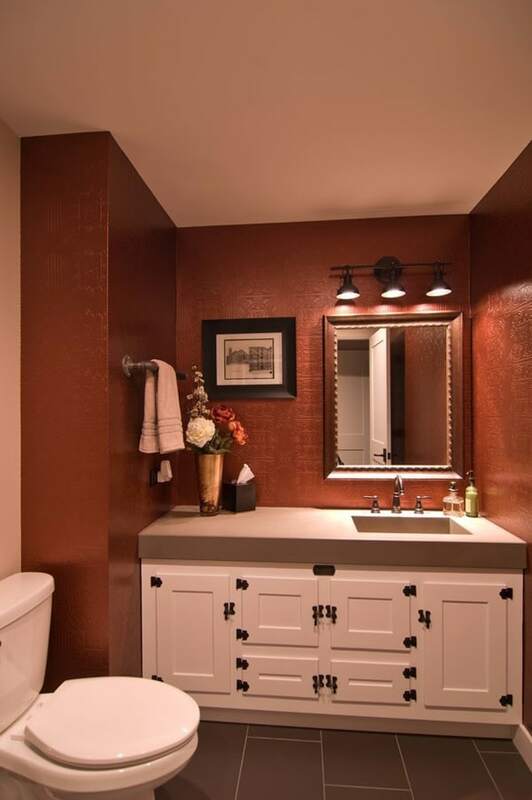 The original master bathroom was cramped and the truss was enclosed by drywall. 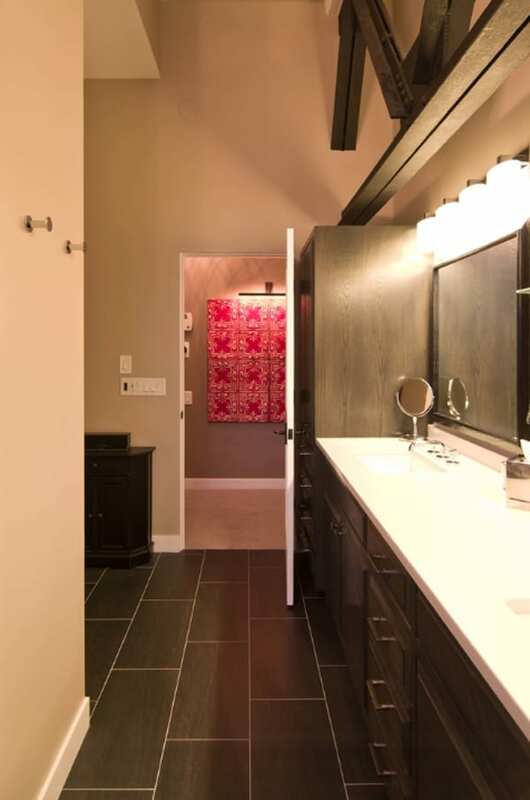 We opened it up and reconfigured the entry to the bathroom and in turn exposed the great truss passing through the space. 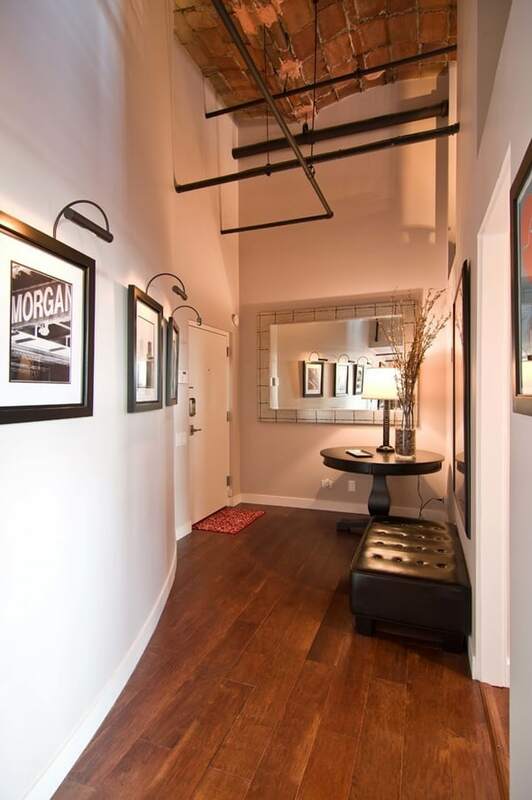 When the steel truss was exposed in this hallway, the owners were glad to find “Carnegie” stamped on the truss. 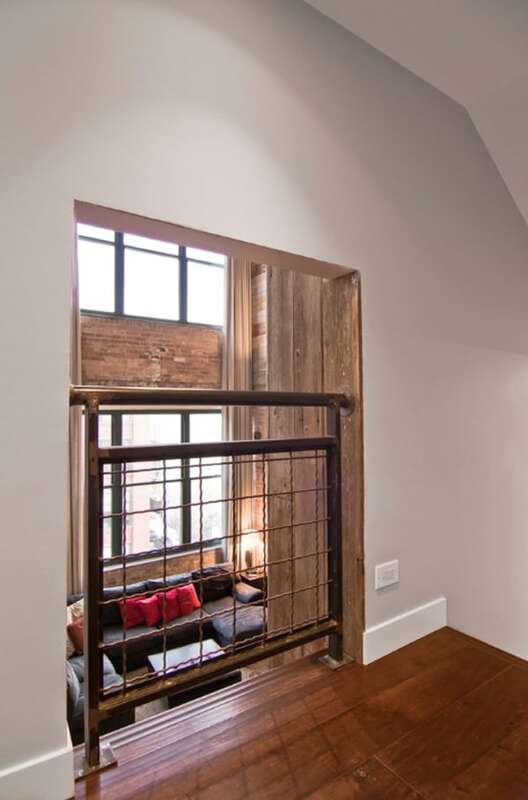 It was fabricated by Carnegie Steel Co. 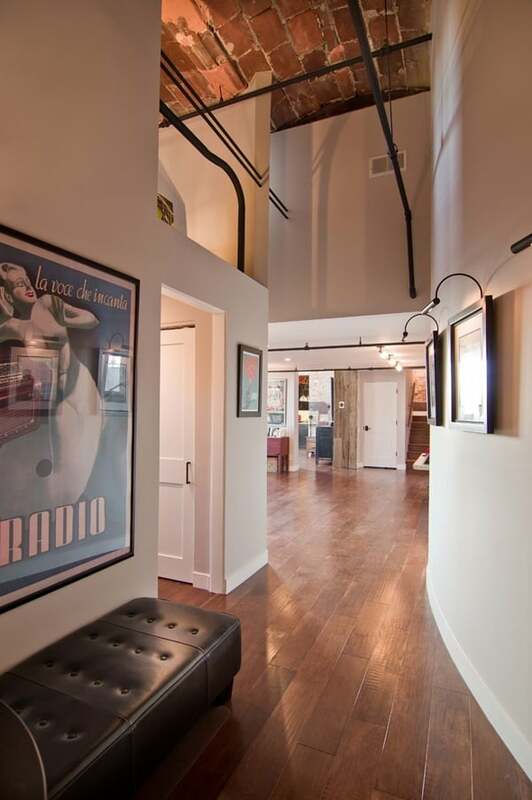 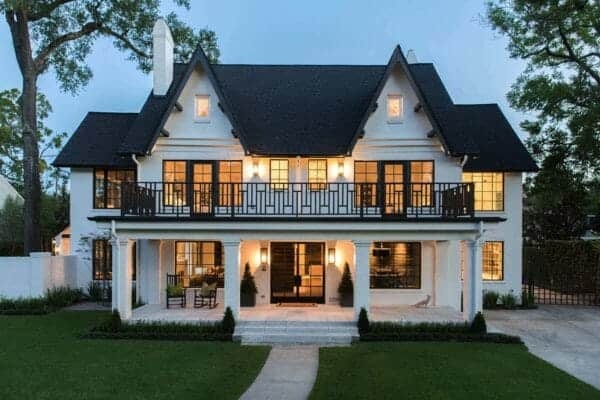 Given the interesting history of the building in which this condo was built, the Owners have tried to preserve some of that history. 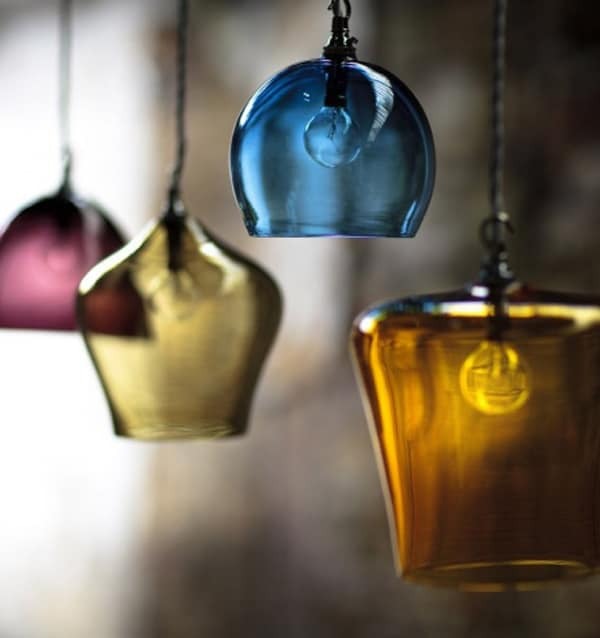 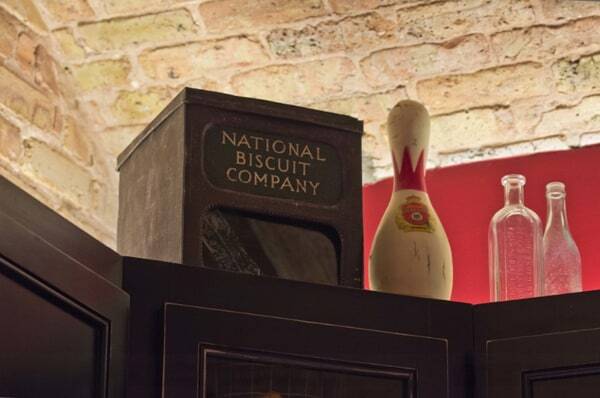 They have found small pieces or accessories that were once used by the National Biscuit Company, and they proudly display them throughout the unit.